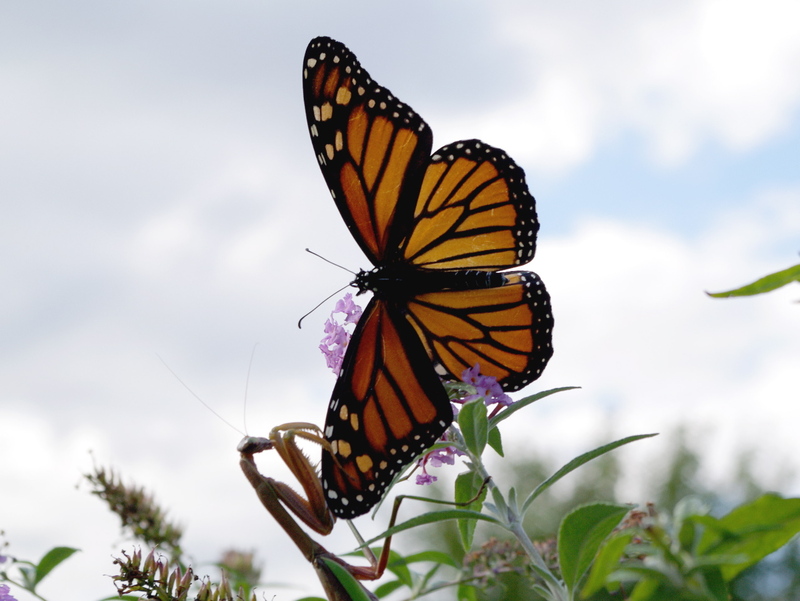 Monarch Butterfly vs. Praying Mantis? My aunt Beverly sent me this picture today. It’s a beautiful shot at first glance, and something of an incredible shot when you look a little closer! All I needed this afternoon was a net & a pith helmet & I would’ve made the perfect butterfly stalker. 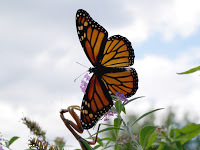 Wave Hill is right in the path of the Monarch Migration, an annual occurrence in early Autumn. I took a dozen poor quality shots of this creature as it moved around the formal garden. Suddenly it appeared to be caught in the foliage, its wings fully spread & I got the perfect shot. It wasn’t until I got it home & on the computer that I realized the praying mantis was holding the butterfly in place for me.